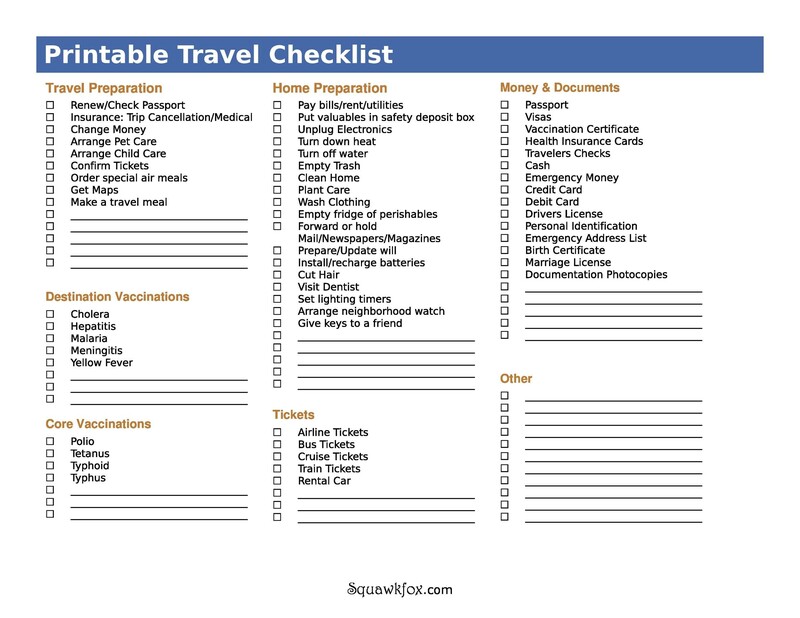 Whenever you are planning a trip, it is important to ensure that you have the things with you that you will need. 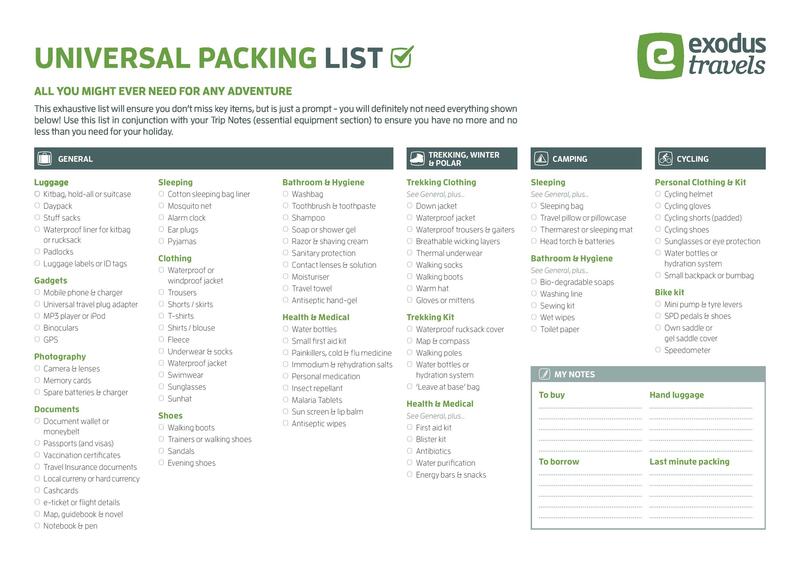 You may think that it is pretty easy to pack what you need, but in order to ensure that you do not forget any important items, you may want to have a packing list. 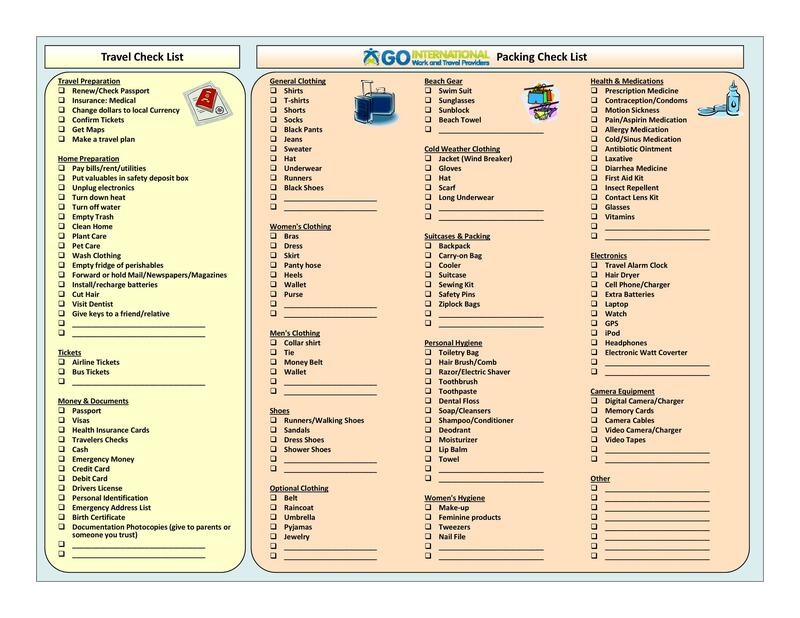 A packing list is a type of checklist that categorizes and lists different items that you may need for your trip. 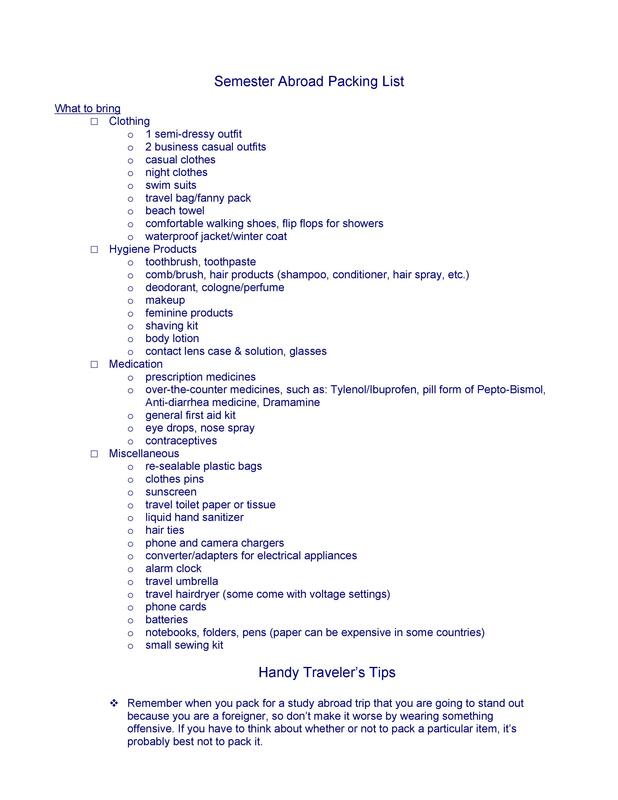 These can be any documents you may need, your clothing, things you will want to have with you while you are traveling, hygiene products, and more. 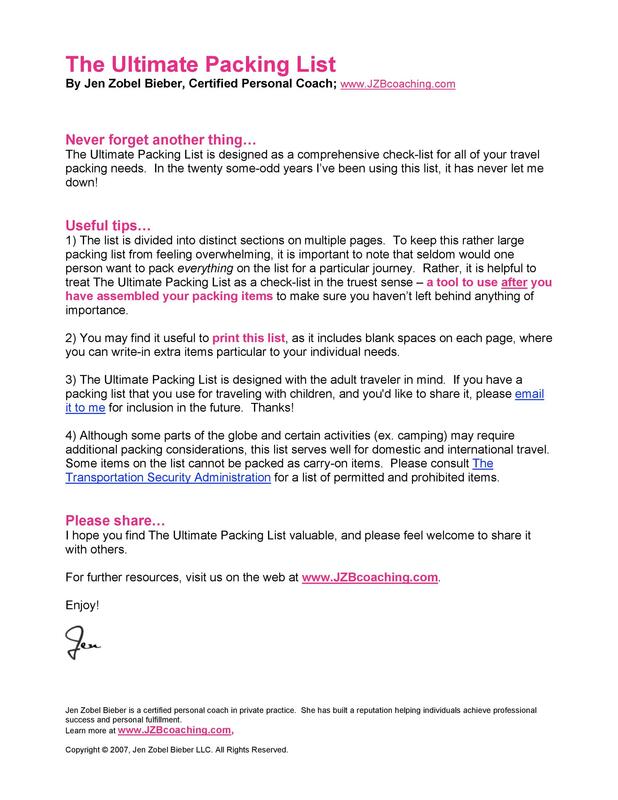 Not everything may pertain to the type of trip you are taking, but some items will. 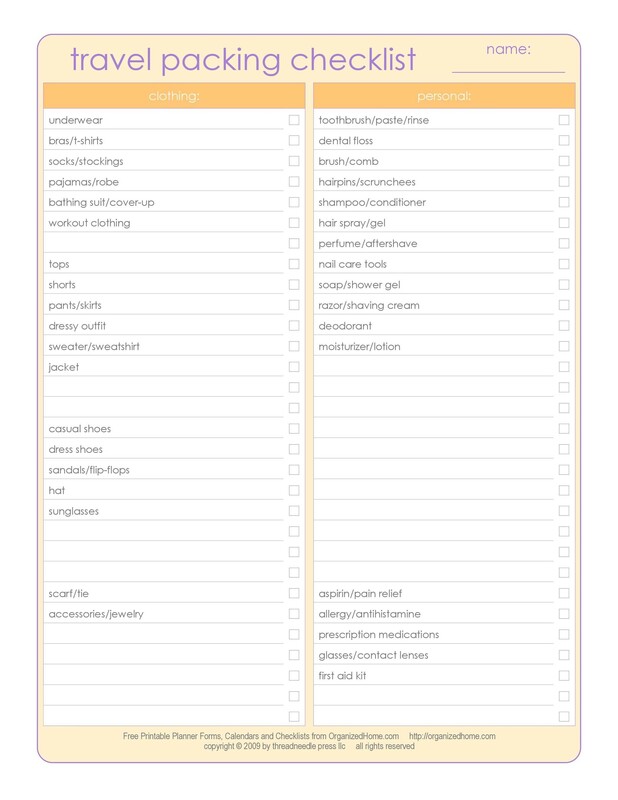 You can create your own packing list or use a premade template. If you want to make your own, you will want to sit down and think about where you are going and for what purposes. What is the distance you will be traveling in order to get to your destination? Is it just an hour or so, or will you be traveling for a number of hours. 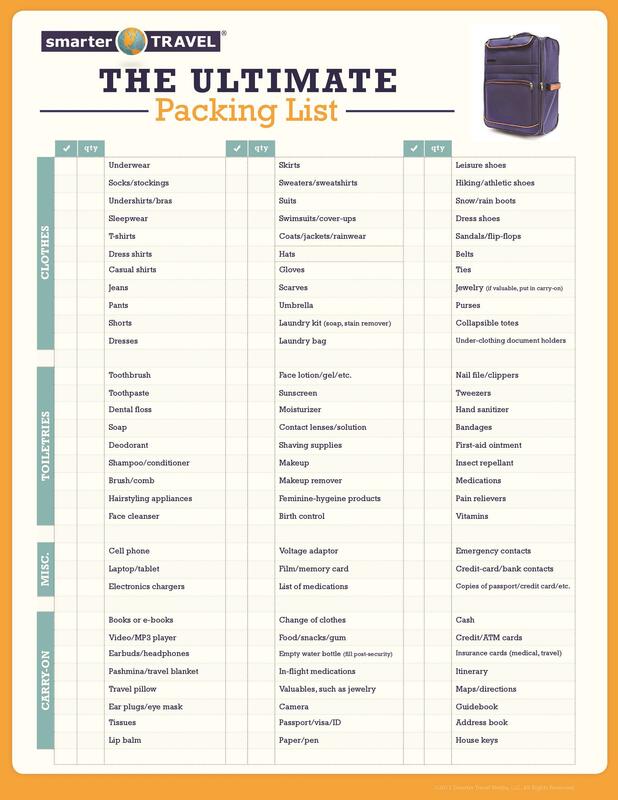 If the trip is longer, you will want to consider bringing snacks and a beverage with. 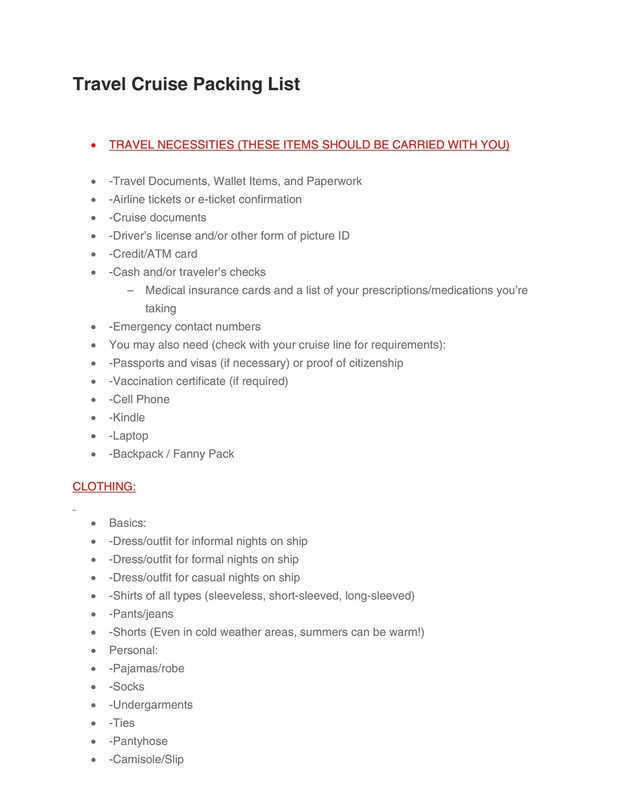 What types of documents will you need to bring with? If you are driving but are not sure of exactly how to get where you are going, then you will want to consider bringing maps or directions to your location. 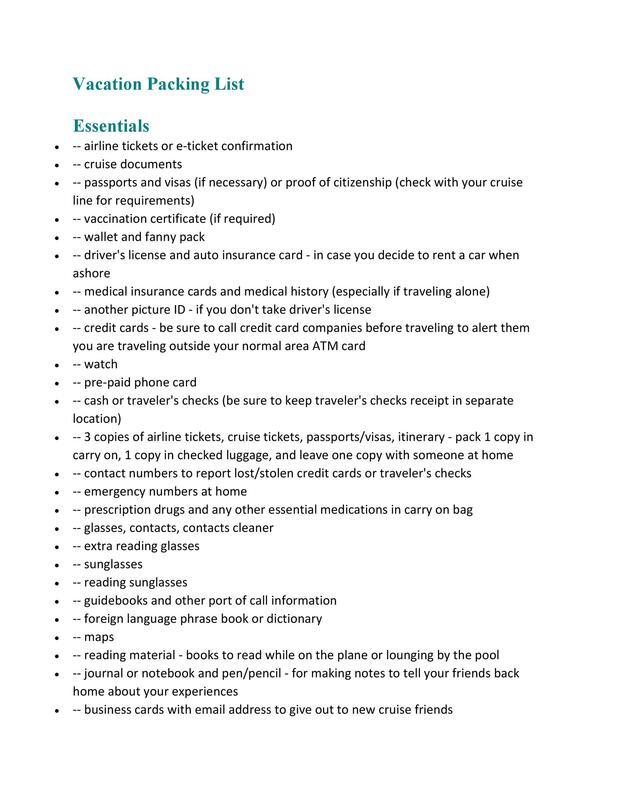 If you are flying, then you will need your travel tickets and possibly your passport. 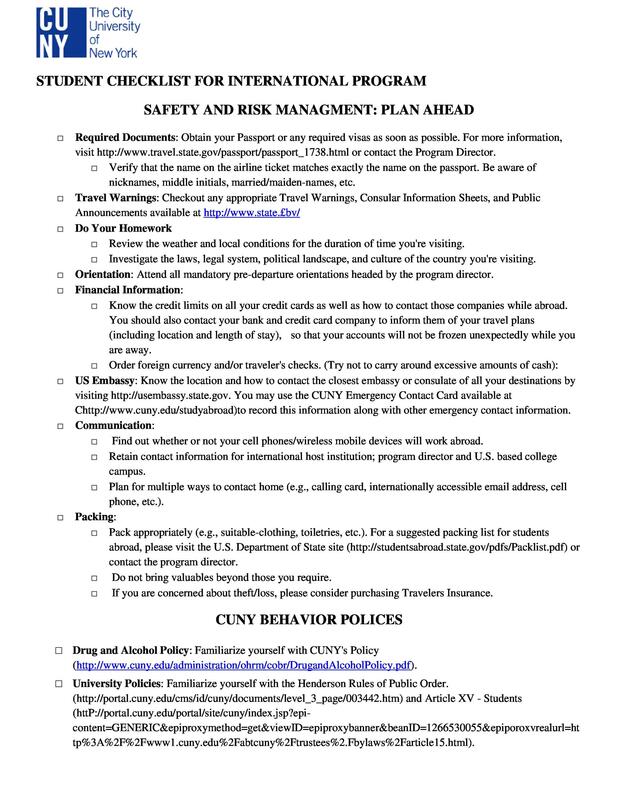 If anyone traveling takes medication, it will need to be brought with. 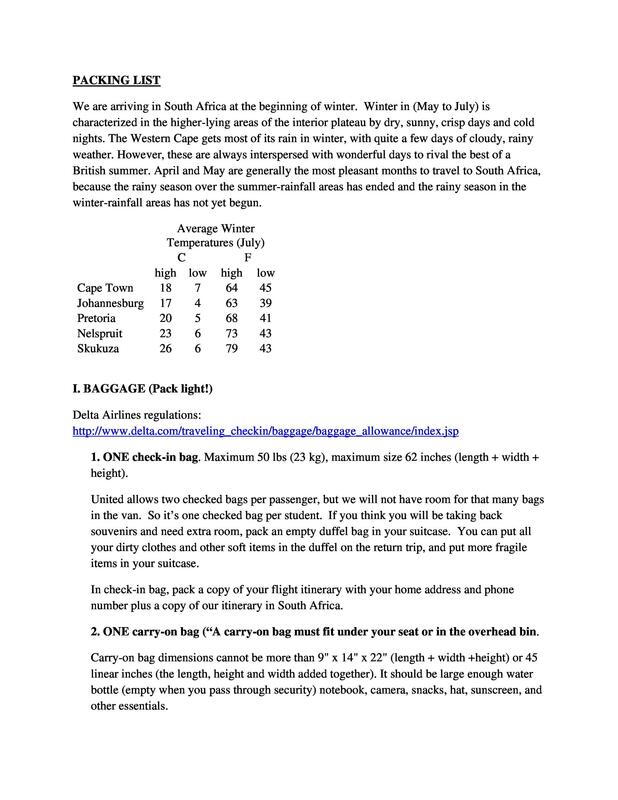 You will want to consider what the average temperature is throughout the day at your destination. 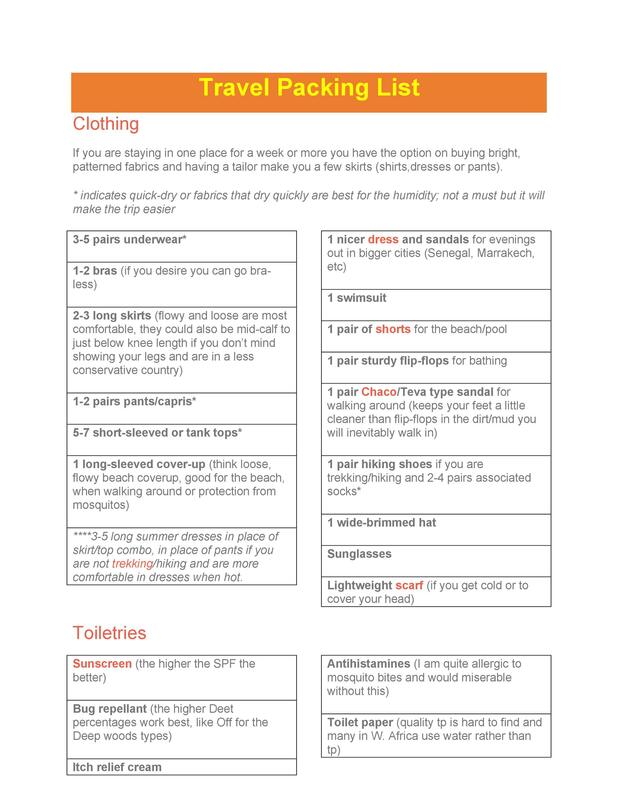 Ensure that you pack the clothing you will need to wear based on how hot or cold it may be. 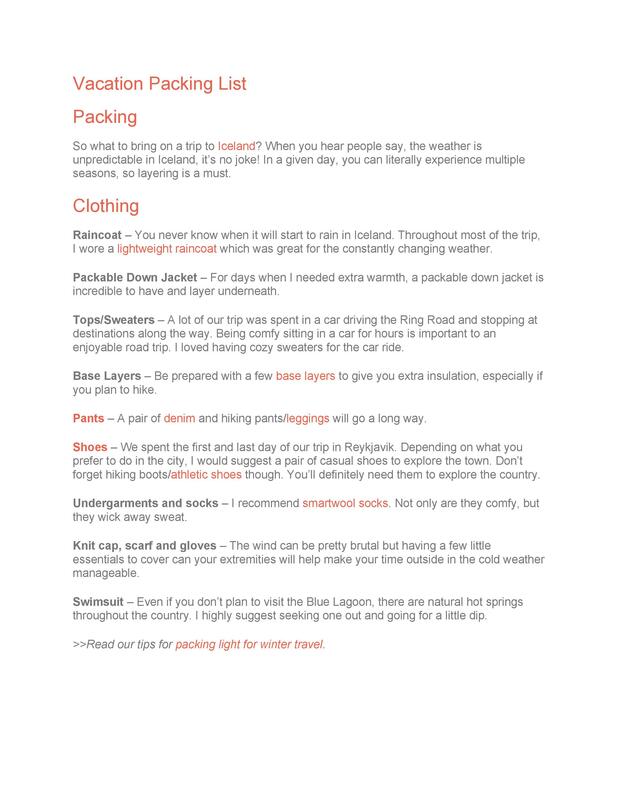 Another thing to consider when planning for clothing, is what you will be doing while at your destination. Will you need casual clothing or even a dressier outfit for a special evening. 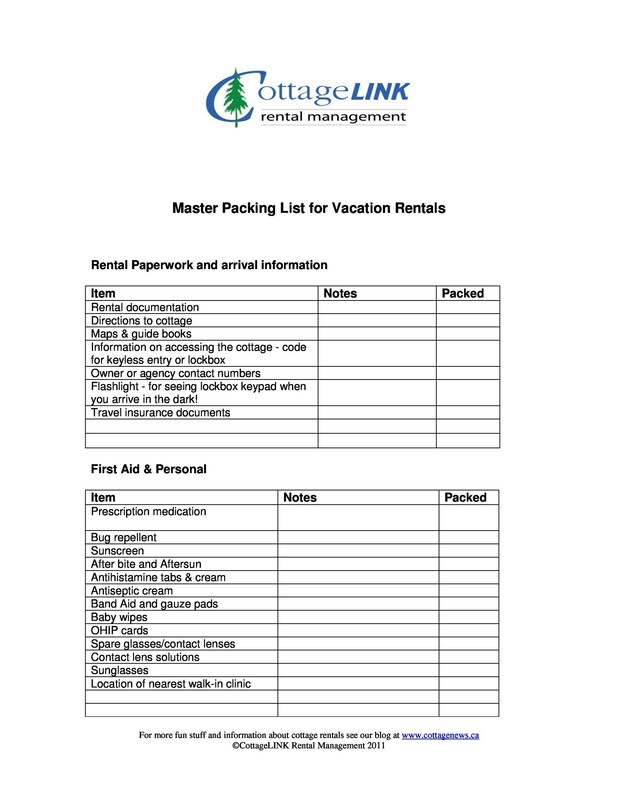 Depending on the type of trip you are taking, you will want to make a different packing list. 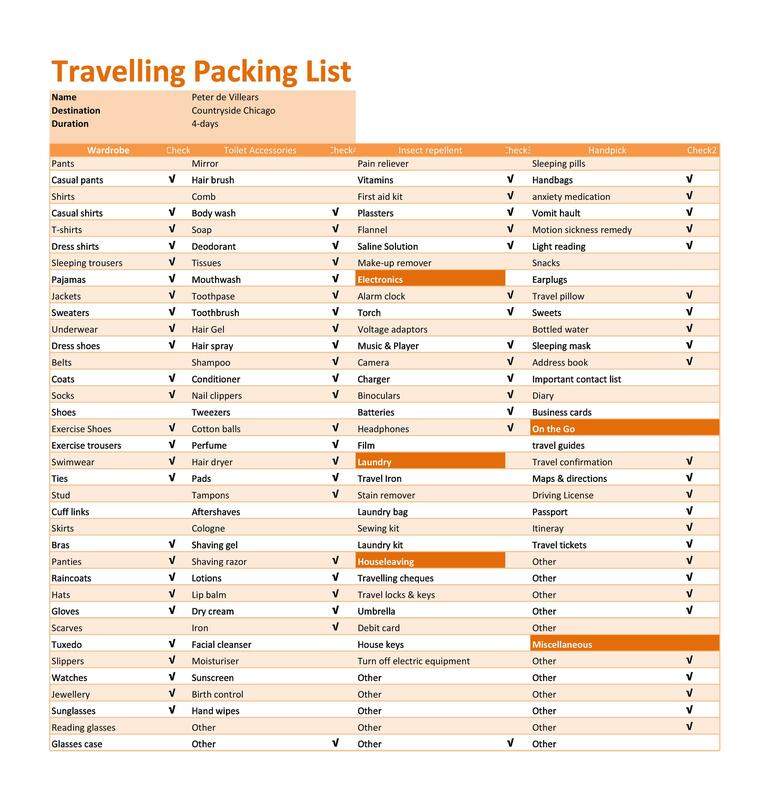 Here you will find some tips for creating packing lists for the different types of trips you may take. 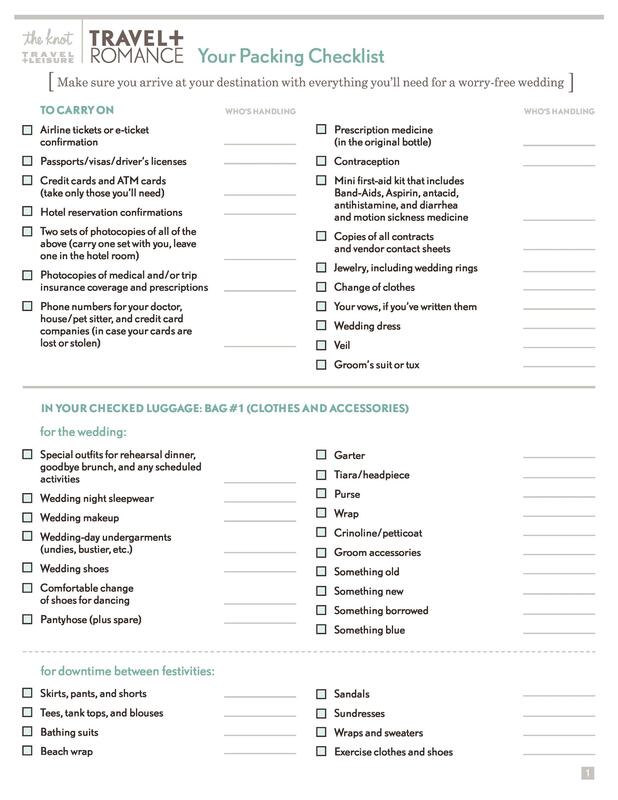 When your next destination is a cruise, there are a number of things you will want to consider when creating your packing list. 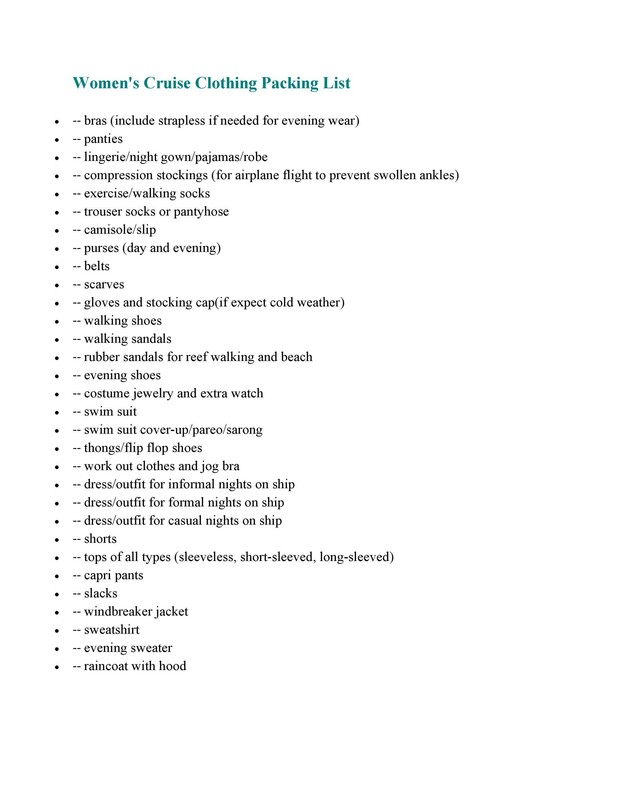 Clothing – Many of the cruises out there have a specific type of dress that needs to be followed in certain areas, restaurants, or times of the day, such as formal dress in the evening. 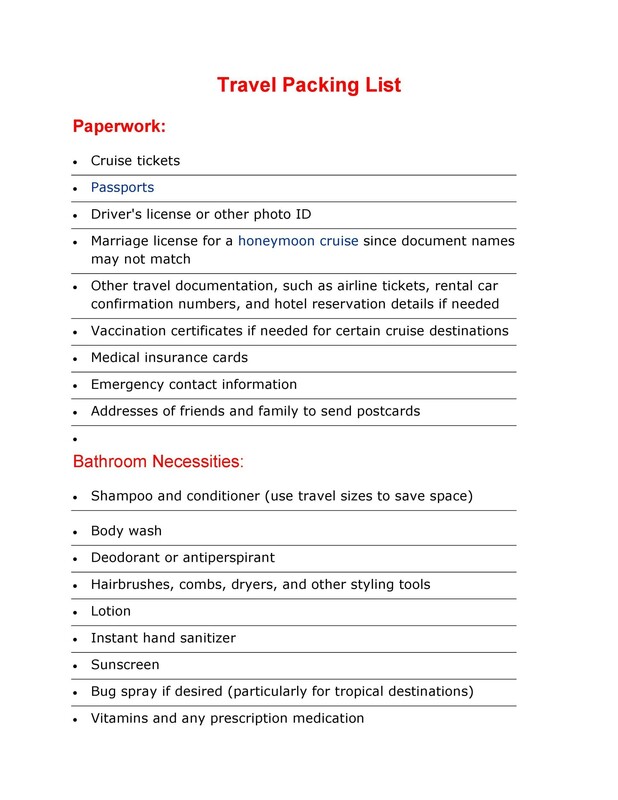 It may not be the same for every day, so it is best to check into what the dress codes are for the cruise. 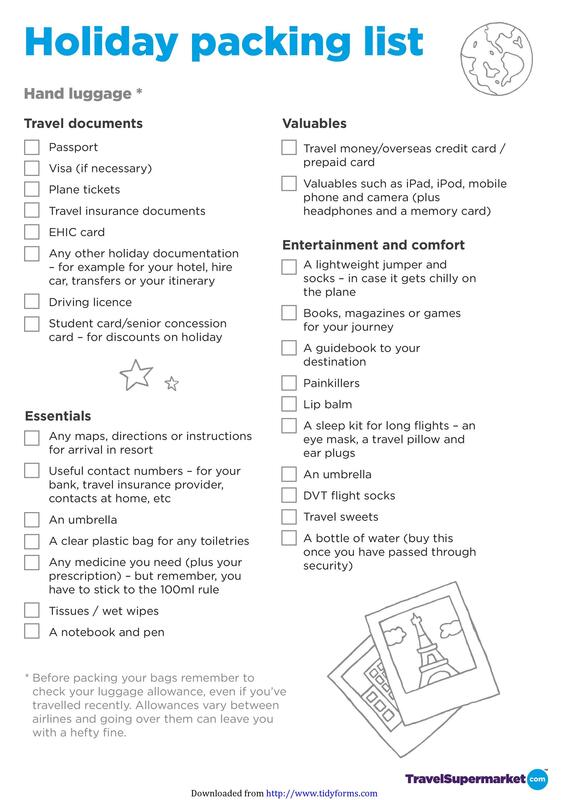 Small bag – When on a cruise, it is best to pack a small bag. 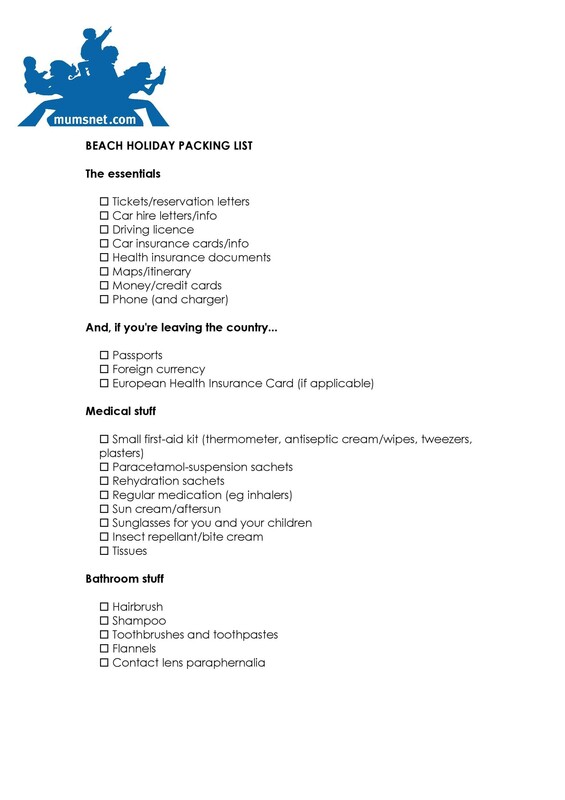 You can then use it when you head to the pool or on a day when you are at port in any city. 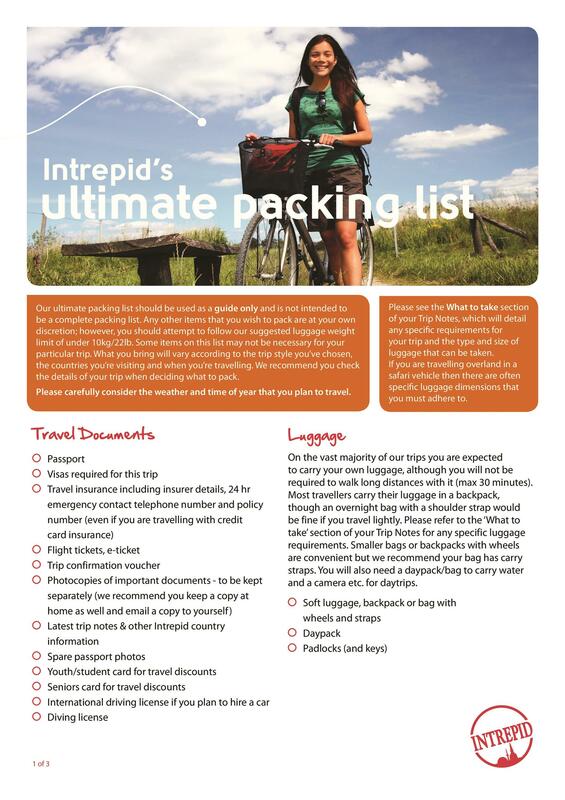 The small bag can carry the things you will need with you. 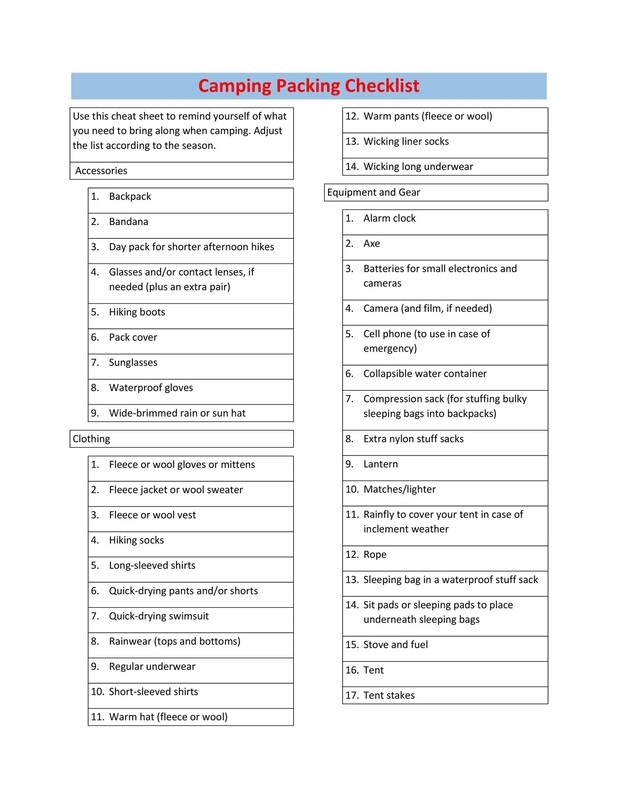 Motion sickness medication – The majority of the time on a cruise, you may not even feel the motion, but if there is a time that you do, it is best to have medication to cure any sickness you might feel. 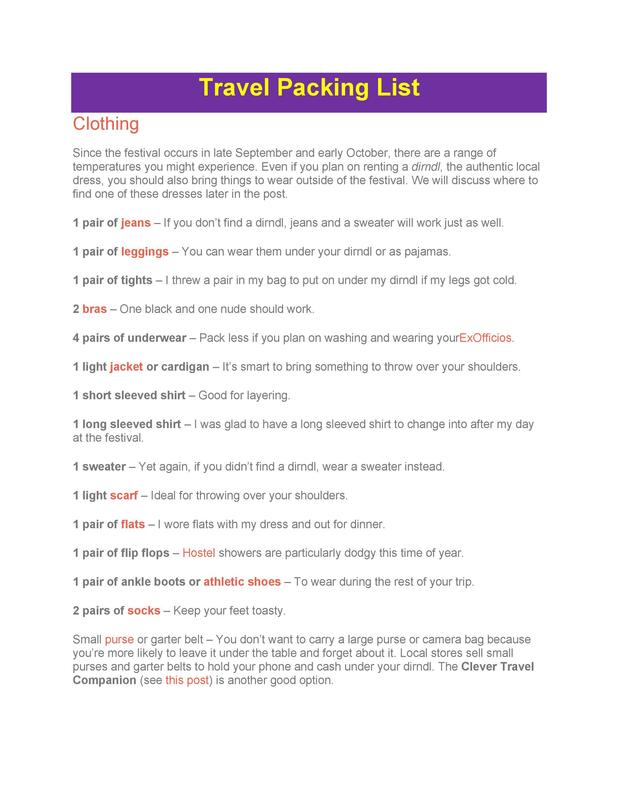 Clothing – You will need to check into what the temperature is at your vacation spot and pack your clothing accordingly. 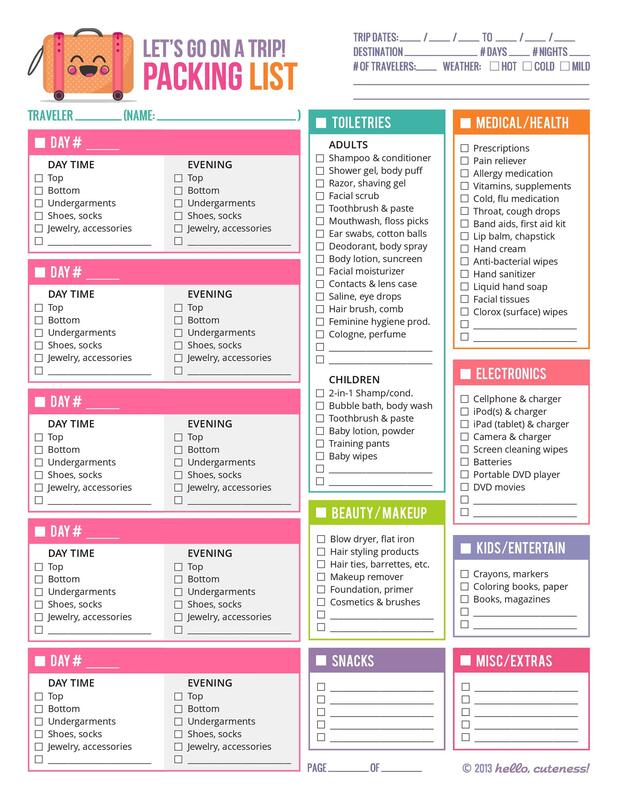 If you are planning a fancy night out or a few nights in the nightclub, then you will want to ensure that you pack for those as well. 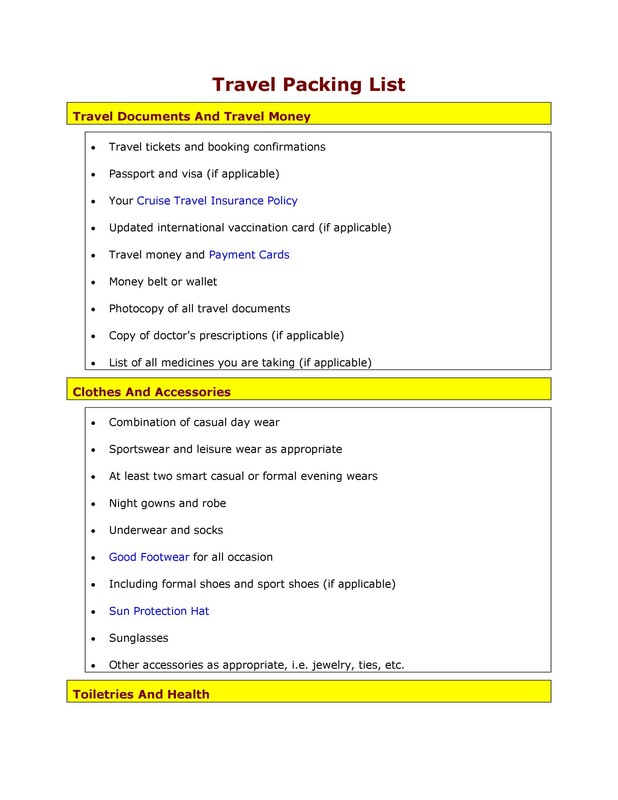 Passport – If you are traveling out of the country, you need to ensure that you have your passport. 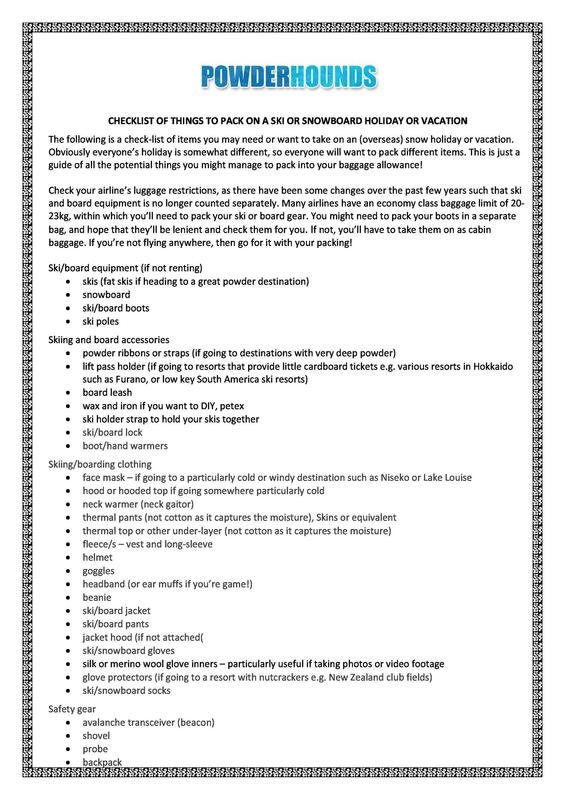 Travel tickets/Confirmation information – If you are flying, ensure that you have your boarding passes. 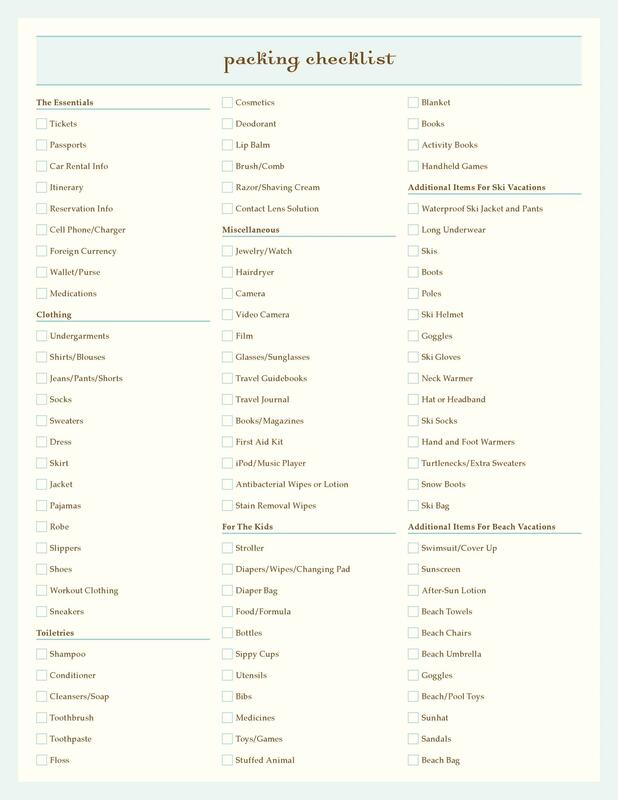 When staying in a hotel at your destination, it is best to book ahead and have your confirmation information. 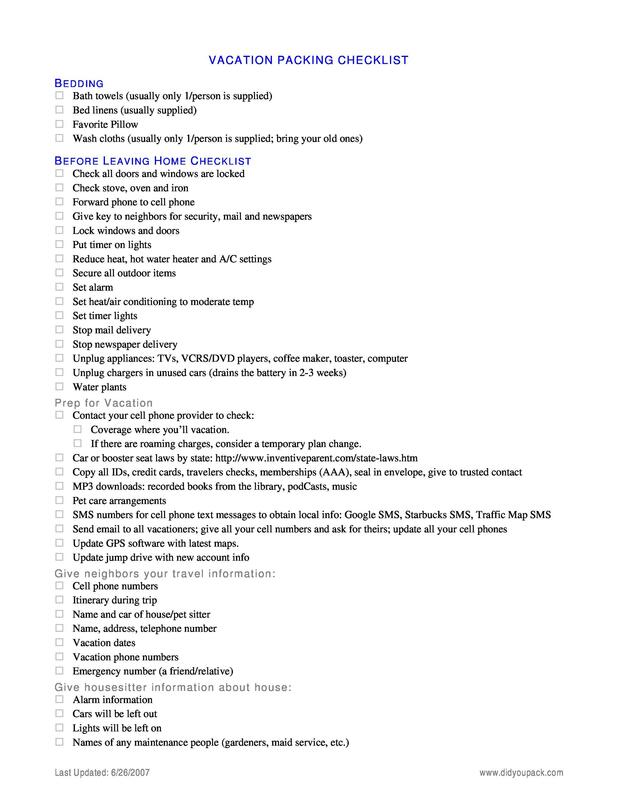 Chargers – You likely have a cell phone that you will be bringing with. 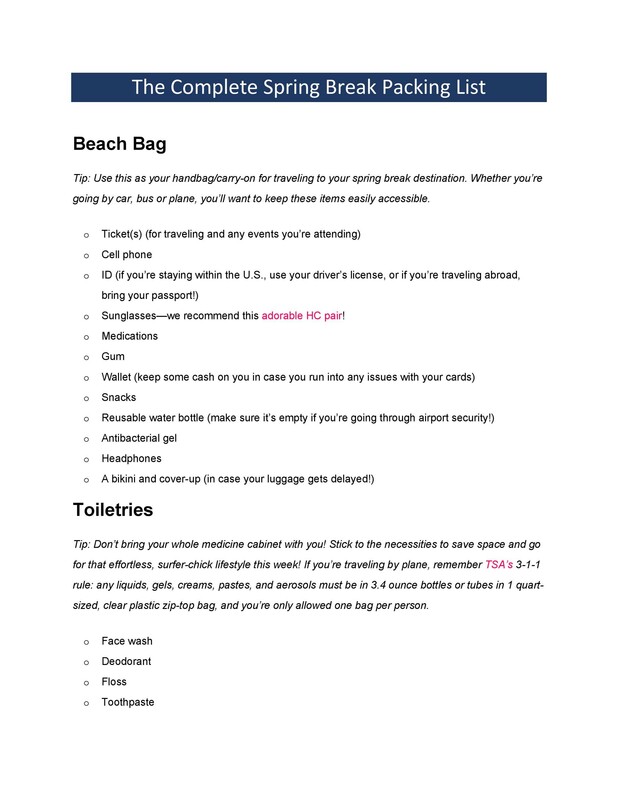 You may also have a tablet or other device that will need to be charged while you are on vacation. Chargers should be brought with for all of these devices. 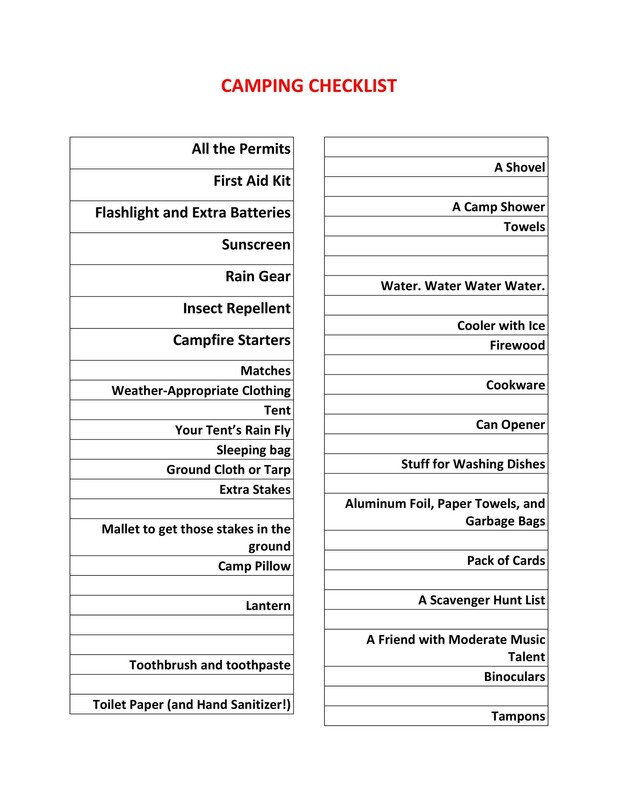 Sleeping bag/Pillows – Whether you are sleeping in a tent or a camper, you will want to ensure you have what you need to sleep. 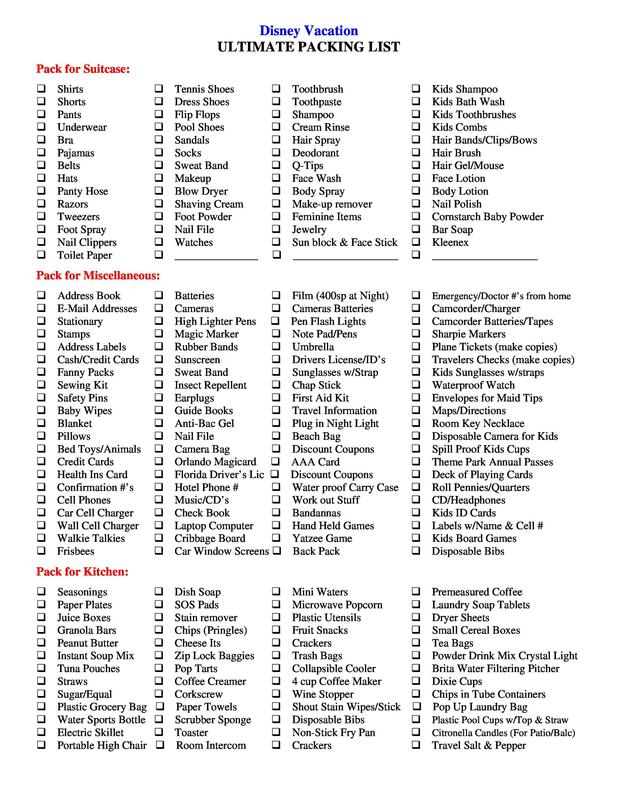 Food/Beverages – Plan the meals, drinks, and snacks you will have while camping, so you can bring everything with. 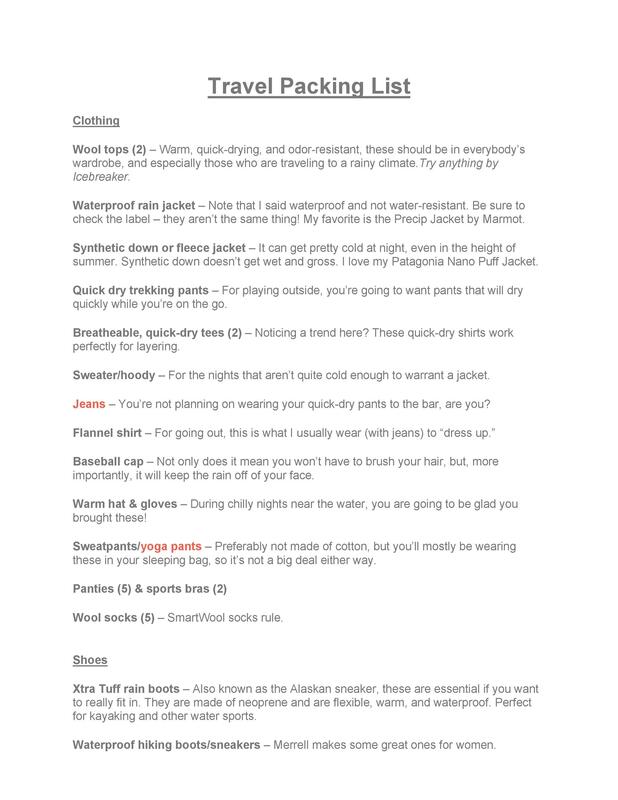 Clothing – Look at the weather forecast in order to determine what clothing you will need. Pack rain gear if it looks like rain and an extra pair of clothing and socks in case a pair gets too wet or dirty to wear. 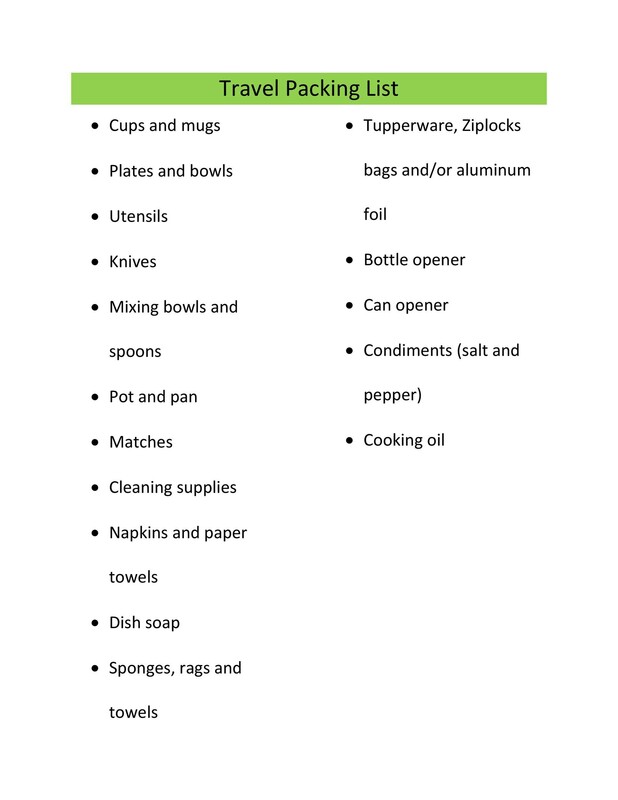 Cooking utensils – Ensure you have what you need to make your meals, whether it is a camp stove, pots, pans, or hotdog roasters (for cooking over the fire). Water – If you will not have access to fresh water, you will want to ensure that you have plenty of water for drinking, washing dishes, and cleaning up. 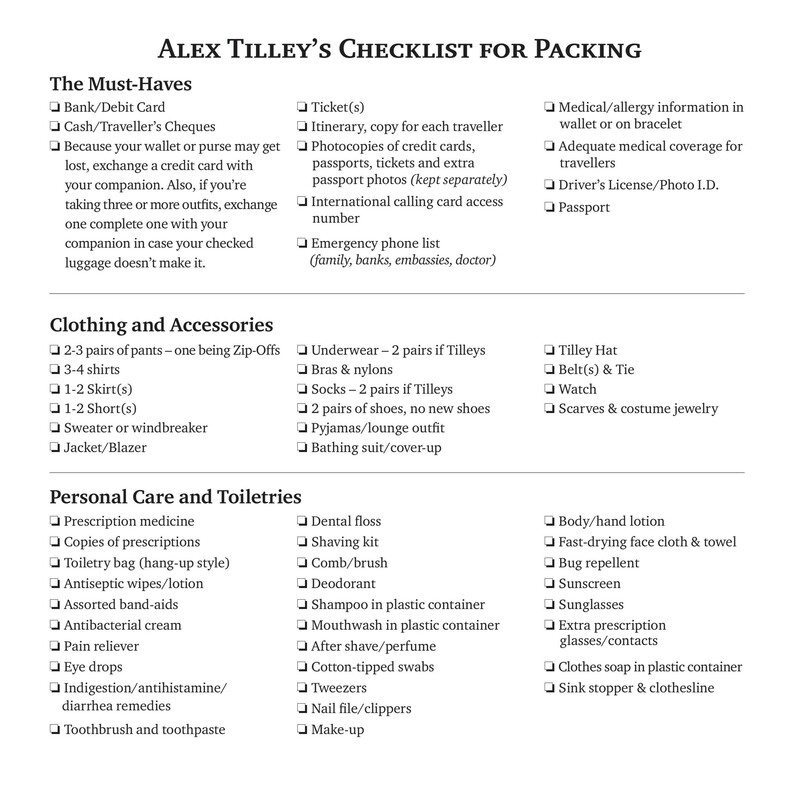 Whether you are traveling for business or pleasure, there are some items you will need to have. 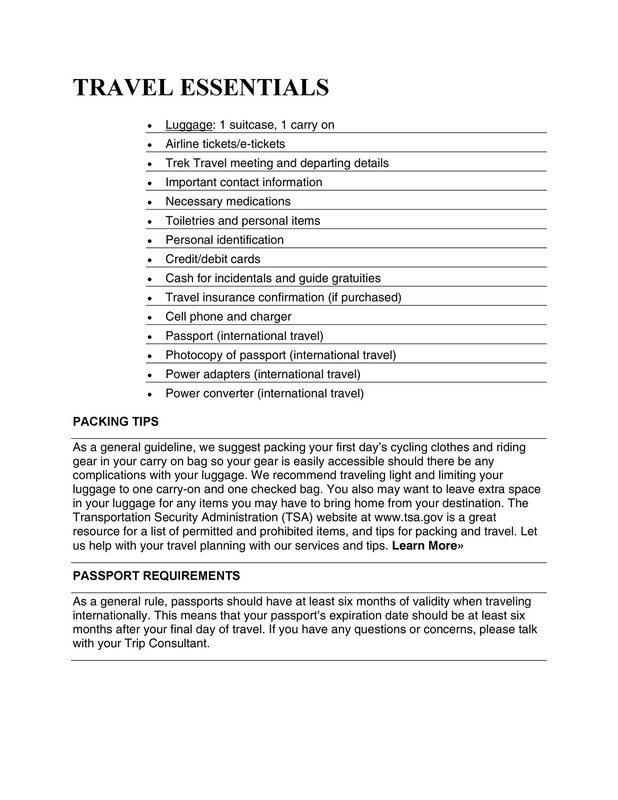 Passport – If traveling out of the country. 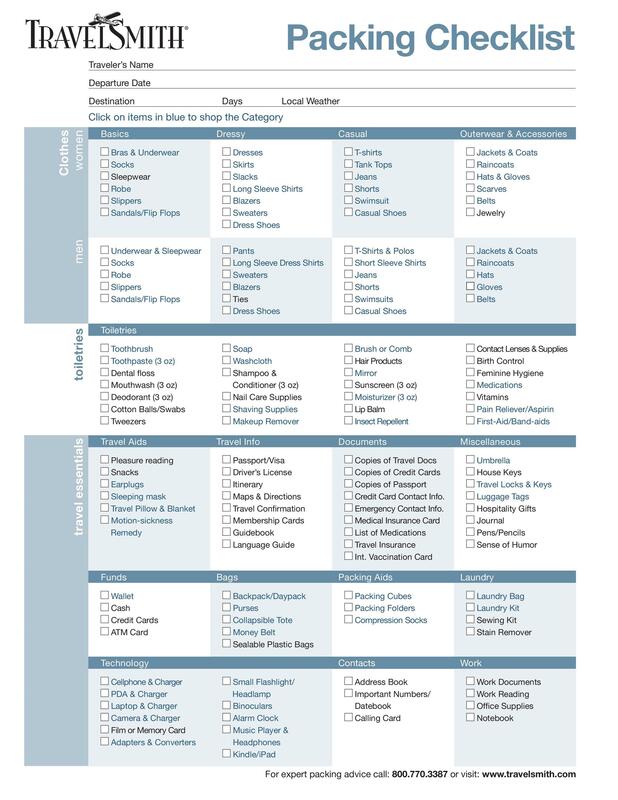 Itinerary – So you know where you need to be, when, and for what. 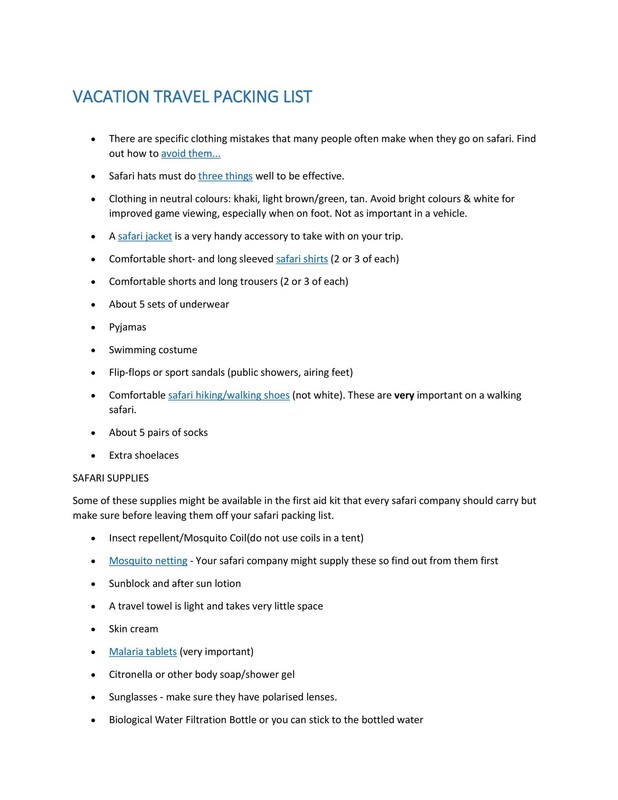 Clothing – You will want to ensure that you have the appropriate clothing for your destination. If you have business meetings or are attending a seminar, you will want to ensure that you are dressed appropriately. 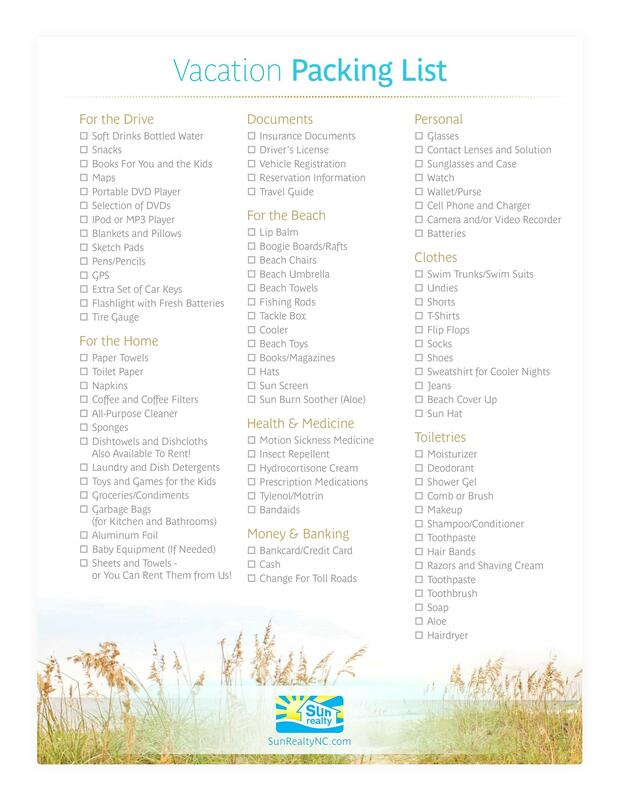 When you are planning a trip to the beach, there are a few things you will want to remember. 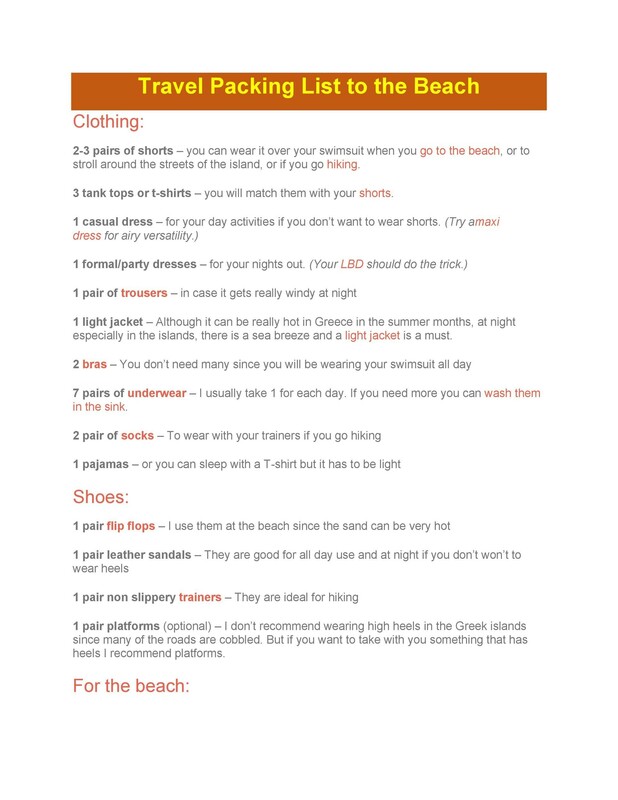 Clothing – It is likely that you will play in the water or do some sunbathing, so you will want to ensure that you wear or bring your swimsuit. 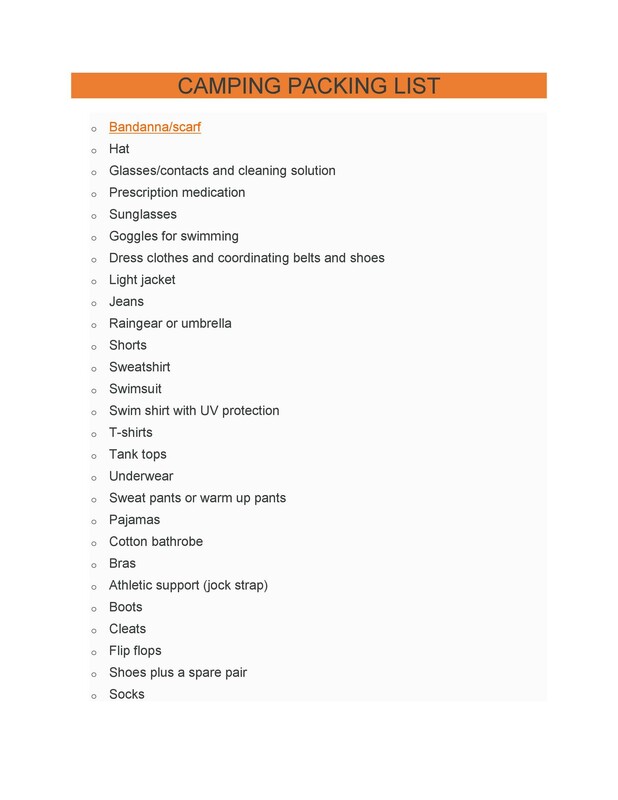 You should also remember to bring a towel to dry off with. 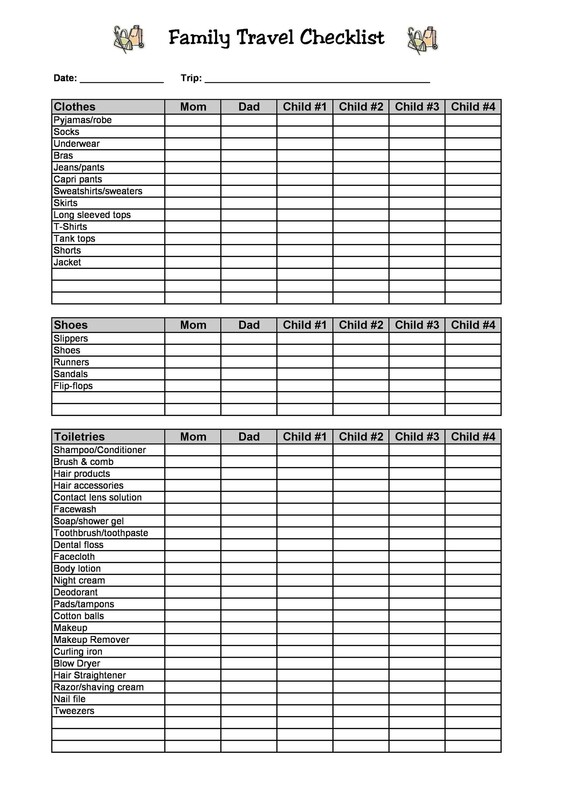 Sunscreen – You may need to apply sunscreen more than once, so you should bring it with. Food/beverages – If it is hot outside, you will want to ensure that you stay hydrated with plenty of water. When staying at the beach for the day, a picnic lunch may be needed as well. Bedding – In order to be comfortable while you sleep, it is important to have everything you need for a bed such as, sheets, blankets, pillows. 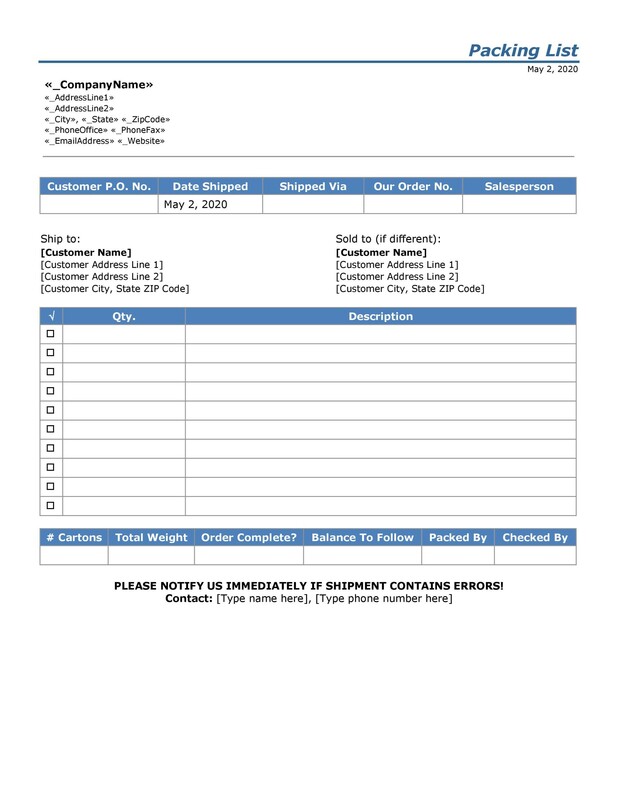 Computer and Accessories – A computer or laptop, mouse, cables, headphones, printer, and paper are all necessary. Desk – A desk will be helpful to work at. 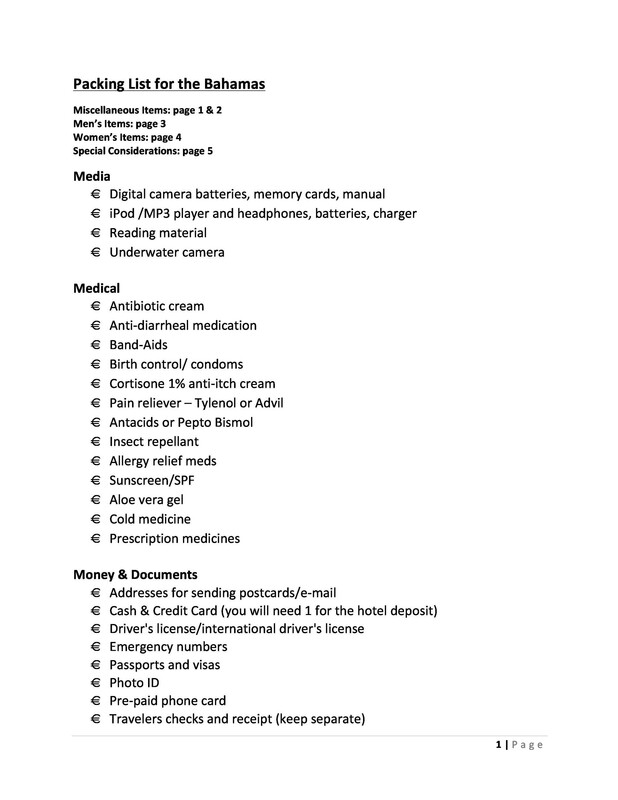 Other items to consider include, a stereo, television, posters, cell phone charger, and mini fridge.